I know, I know. Tuesday isn’t anything too special to get excited about … is it Friday yet?! But then again … why be more happy for one day over another, or for the work week versus the weekend, when each day presents boundless, beautiful opportunity to be who you are now or to make positive progress toward a goal or dream? I wanted to start this post off with a quote taken from one of my favorite newsletters, The Daily Love. Perfection is boring. And who wants to be perfect, really? When you’re perfect, you’re never having new experiences, or seeing old experiences in a new light. That leads me to why I chose to cut up that pretty ugly Minnie Mouse oversize sweatshirt above — it was NOT perfect when I thrifted it from a Goodwill Outlet a few weeks ago, however, I saw the POTENTIAL for a new experience of how I could [in my new favorite expression, as inspired by style expert Tim Gunn] “make it work” for me. 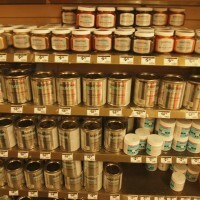 Do you believe in DIY magic? 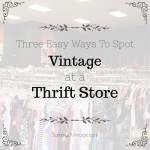 Then keep reading after the jump for a step-by-step tutorial of how you can thrift any ‘ole kitschy sweatshirt and cut it up into more magic than an actual trip to Walt Disney World. Think of your scissors like the magic wand in Disney’s famous Fantasia movie. 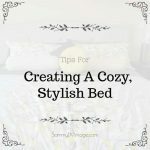 You have the power to transform — using your own creative eye and style – any piece of material into a cute, chic crop top or just something with a bit more style than all of that “size” in oversize. 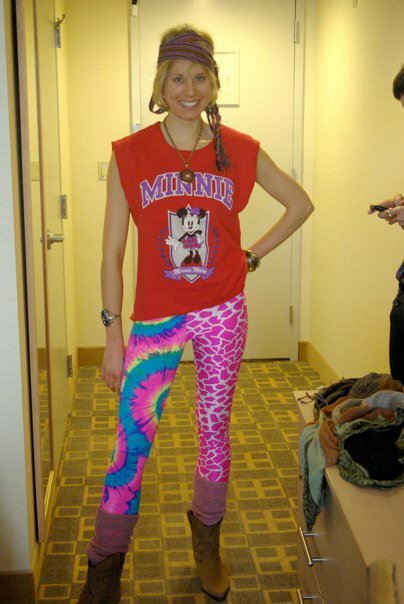 While ’80s novelty prints were hot for spring last year and leggings are still going strong, wearing things that are too large is more appropriate for bedtime [trust me — I do it all the time!]. Cutting extra material from those T-shirts and sweatshirts we don’t wear isn’t only on trend — it’s sustainable, because by removing some extra fabric, you’re adding new life to a piece versus letting it collect dust in your closet. And who DOESN’T want to channel some magic a la Fantasia into their wardrobe?! Thanks for checking in, everyone! 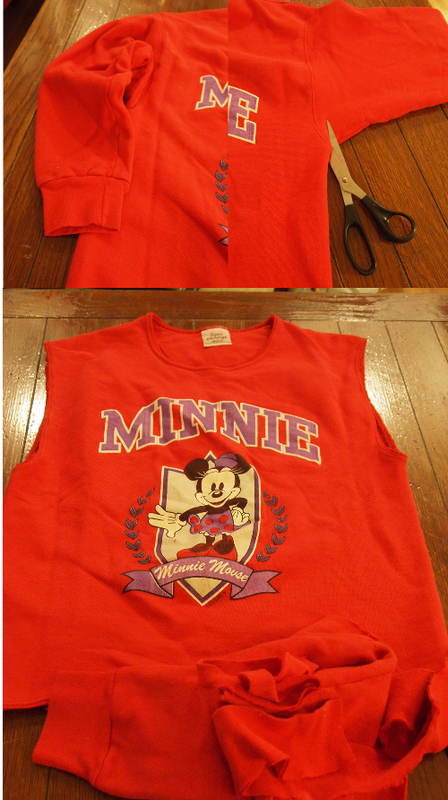 Let me know what you think of my Minnie Mouse DIY magic … and share with me via Facebook, Twitter or email any of your own DIY creations, whether in sewing, cutting or simply styling! WHAT? 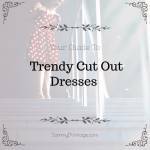 Cutting off the voluminous sleeves. WHY? The sleeves are bulky because of space that is prominent because of the tapered sleeves that create a not-so-attractive “balloon” effect to your arms, making them appear wider than they really are. HOW? Find the seam between the body of the sweatshirt and its arms. Cut into the sleeve at the bottom of the armpit, following the seam and cutting in a full sweep around until the entire sleeve is removed. WHAT? 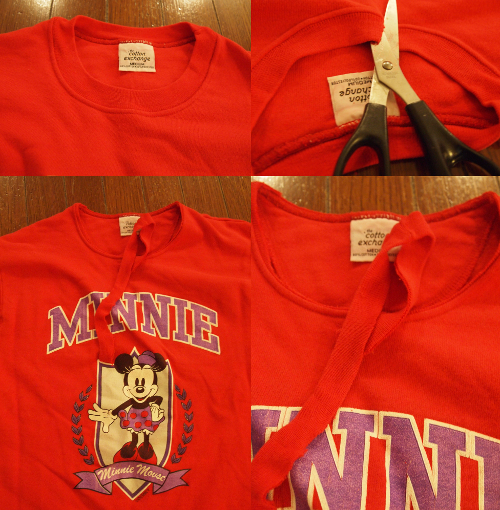 Removing the sweatshirts tightly fitted crew cut neck. WHY? Extra material at the neck gives the sweatshirt a stuffy, stiff feel. Ever notice how a V-neck shirt can just be so much cuter than the same tee in a crew neck fit? 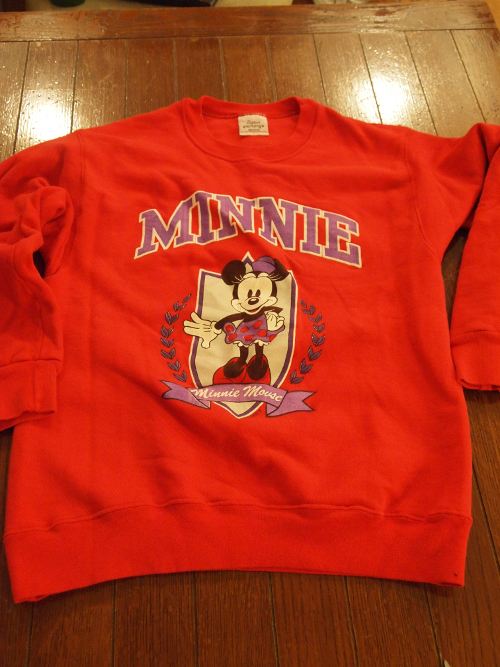 Showing some skin — no matter how little — works wonders to modernize Miss Minnie’s sweatshirt. HOW? From the top of the crew neck, cut about one half inch into the seam. Stop cutting at the seam and turn your scissors around so that they follow the seam, removing that extra 1/2 inch of fabric from around the neck. WHY? Once you’ve shaped the sweatshirt into a scoop neck at the front, you want to create a parallel effect in the back by removing that extra “flab” of material from immediately behind your neck. Adding “back space” gives the entire look a very spring/summer wearable feel thanks to the “cut-in” breathing room for your skin. HOW? 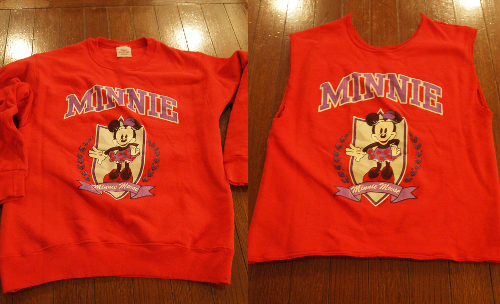 Miss Minnie makes it easy to remove the “back fat” from this sweatshirt thanks to its visible seam. 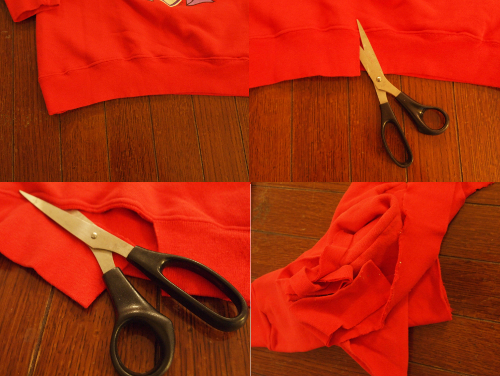 Cut vertically into the sweatshirt at the back of the neck until you hit the seam, which follows a crescent moon shape. Cut along the seem until the extra material is removed. WHAT? Removing unnecessary “waist” material from the bottom of the sweatshirt. WHY? Because you’ve already removed the collar, neck and arm “fat” from this oversized lady, you want to snip those voluminous inches from the sweatshirts bottom, too. Shortening the sweatshirt will give it a strong T-shirt feel. 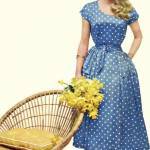 No one will ever know it was once a matronly monster! HOW? 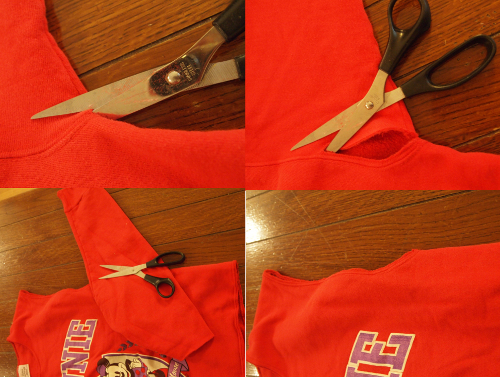 Cut into the bottom of the sweatshirt until your scissors hit the seam. Turn scissors so that they cut parallel along the seam. Keep cutting until that extra inch along the bottom is completely removed. The seam makes this “crop chop” effect easy. If you want to shorten the length by more than the seam parameters allow, take a permanent marker and lightly mark a line using a ruler across the bottom of the sweatshirt. Using your scissors, cut immediately above the line. Important: cut BOTH sides of the sweatshirt — i.e. double fabric cutting — so that your back doesn’t end up shorter than your front, and vice versa. Before marking the sweatshirt for additional choppage, put the shirt on so that you have an idea of where your “midriff baring” comfort level resides. WHAT? 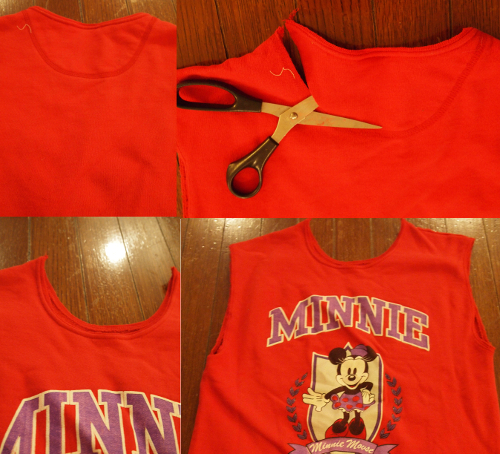 After removing the sleeves, collar, neck and extra waist, you’ve know got yourself a very modern, magical MINNIE! WHY? The design of this oversize darling was too good to pass up. Mickey & Minnie Mouse are iconic vintage cartoons. Whether you’re buying old or new Disney designs, it’s a worthwhile investment to brighten up your day with the innocence of what it means to believe in the magic of your dreams. 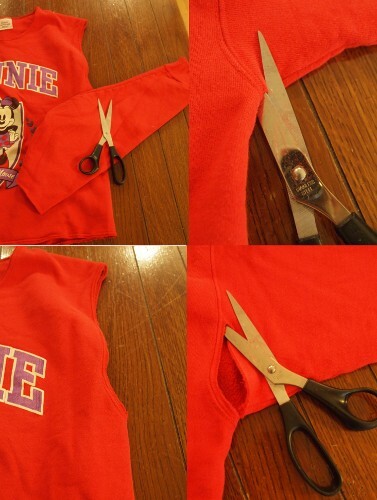 THE DIFFERENCES: Thanks to the snip snip, the once dowdy sweatshirt is now a darling of design. 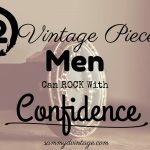 THE MAGIC: Removing extra material lessened the unattractive volume and shows off your true, stylish self. WHAT? 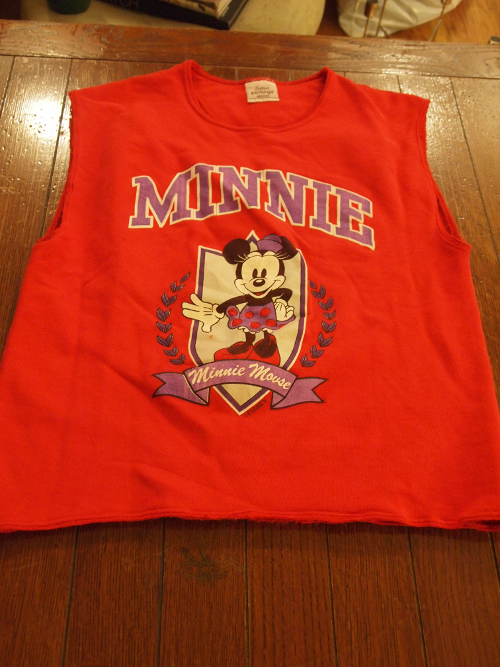 The final oversize Minnie monster to chic crop cutie look. WHY? 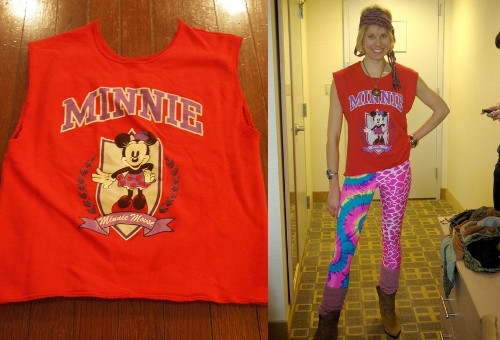 Because it’s just more fun to wear Disney characters when you’re 25. « Announcing the Winners of the Gratefulness Giveaway! I have gotten this sweatshirt from my bro. Is this a good candidate to be re-vamped ? It’s actually very complex in this full of activity life to listen news on Television, therefore I only use world wide web for that purpose, and get the hottest news.